Last year, Christian radio magnate Harold Camping predicted that the apocalypse would begin with Christ’s return on May 21, 2011. He then clarified that the rapture would actually begin in earnest on Oct. 21, 2011. This year, the Mayan calendar (aka the Mesoamerican long-count calendar) and its alleged prediction/inference/whatever that the world will end on Dec. 21, 2012, is all the rage. But that doesn’t mean that we can’t have fun with all of these predictions of the end of days. In fact, I think there’s a lesson to be learned here. One oft-asked question—a question which makes up the basis of our 10 “End-of-Days Exit Interviews” scattered throughout this Best of Tucson®, in fact—is something to the effect of: If you knew this were your last day on Earth, what would you do? The lesson: Well, why don’t we live our lives—within reason, of course—with that question in the back of our minds all the time? As for the “within reason” part, it’s foolish to, say, buy a $2,000 bottle of wine if we can’t afford it, or blow off our work commitments, or do other things that would harm us in the long-term. After all, this is probably not your last day on Earth. But within reason … why don’t we all do more every day to, well, live life? I know a lot of people—including myself—who get stuck in the ruts of work and chores and etc., and often forget to live life. Well, screw that. Let’s start living life. In that spirit, those of us at Weekly World Central offer you this issue. We’ve been hard at work on it since March, and we’re happy with how it turned out. We hope you’ll use this issue as an aid to help you savor and revel in all that Southern Arizona has to offer. You know, to live life. Thanks to everyone who contributed to this issue—from artist Jeff Drew, who turned in some fun and hilarious (and, frankly, weird, in a good way) illustrations, to photographer Joie Horwitz (who almost had too much fun taking pictures, as you’ll see), to the 31 different writers who penned blurbs, to the ad-sales folks and distribution drivers and ad designers and so on. But most of all, thanks to you, the Tucson Weekly reader, who took the time to vote, and perhaps to suggest categories or staff picks. Thanks in advance for checking out the various places, organizations and so on spotlighted here. Read. Enjoy. Take notes, if you’d like. And then get out and live life. 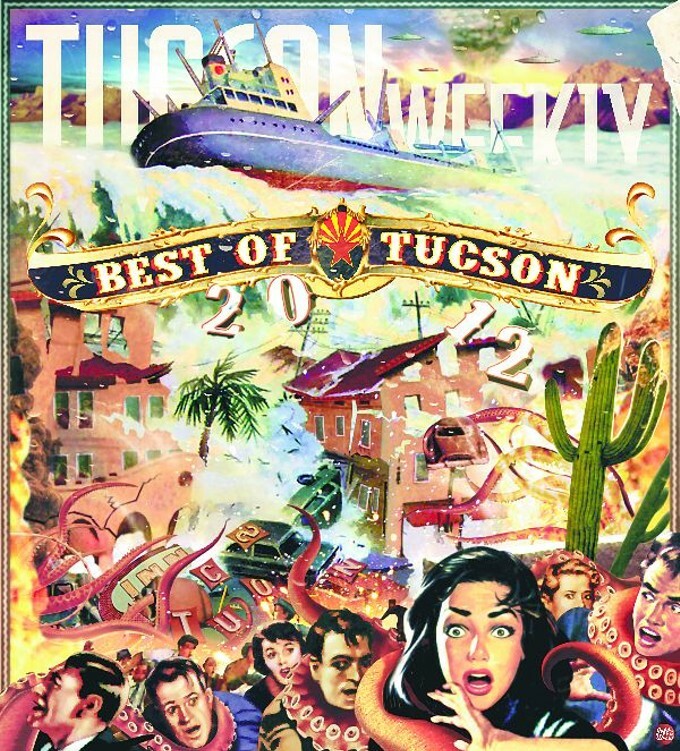 Welcome to Best of Tucson® 26: Tucson Apocalypse. Best Mexican Food at a Non-Mexican Restaurant – Fish Tacos at Barrio Brewing Co.